While in San Luis Obispo for Memorial Day weekend, I stopped into Sidecar, one of my new favorite bars to visit while on the central coast. Last time I visited Sidecar, I just got a couple drinks (they are pretty well stocked with some good bourbons and whiskeys), and had some popcorn at the bar. This time, I wanted to sample their restaurant menu. It also happened to be my birthday so I was pretty excited to celebrate with some mac and cheese. I ordered the Butternut Mac, which includes roasted butternut squash, vermont cheddar cheese and is topped with breadcrumbs. It wasn’t very rich, but had some good flavor. I think that it would have really soared if it had had a creamier sauce. The cheese and butternut squash had a tendency to just kind of clump together on the noodles. The topping didn’t add much in the way of flavor and felt more like a slight texture change. The portion was great, though. I barely finished half of it. 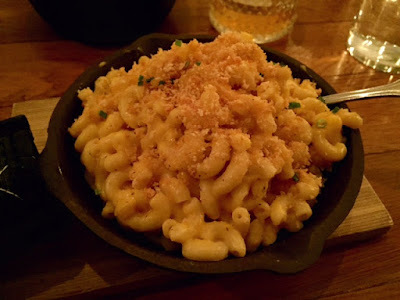 If I were to return to Sidecar, I probably wouldn’t order the mac and cheese. I’d probably inquire into their market cut or market fish selections. My boyfriend ordered their market cut, which was a delicious steak with some really good mashed potatoes and veggies. Another dish I would look into would be the tator tots side, which I’ve heard is pretty delicious. If you find yourself in San Luis Obispo, definitely give Sidecar a visit, if not for the mac, but at least for the great bar selection, some really good popcorn and a cool environment.